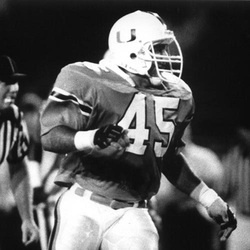 George Mira, Jr. was considered the nation's premiere middle linebacker from 1984-87 when he was the leader of one of the most dominating defenses that college football has ever seen. Mira, Jr., a local product out of Palmetto High School, led the Hurricanes in tackles for three straight seasons in 1985, 1986 and 1987. Additionally, Mira, Jr. was the first player in UM history to start three consecutive New Year's Day Bowl games. He finished his Hurricane football career as the school's all-time leader in total tackles with 490 and held that distinction for 13 years until Dan Morgan piled up 532 in his four-year career that ended in 2000. In 1986, he finished sixth in the balloting for the Butkus Award, given to the nation's top linebacker. In his final season, the Associated Press named Mira, Jr. Third-Team All-American. One of the hardest hitters the Miami football program will ever see, Mira, Jr. came up big in the big games. In the nationally televised showdown with the No. 1 Oklahoma Sooners at the Orange Bowl in 1986, Mira, Jr. recorded 17 tackles in a 28-16 victory for the then-No. 2 Hurricanes. Miami would go on to be ranked No. 1 for the remainder of the regular season. He also piled up 18 tackles on the Sooners a year earlier as a sophomore in unranked UM's 27-14 upset over No. 3 Oklahoma in Norman in 1985. That effort got UM ranked once again and for the remainder of the season. His final season for the Hurricanes in 1987 saw Mira, Jr. record the top two individual game tackle totals by a Hurricane until the likes of Ray Lewis a decade later. In a 24-0 rout over No. 10 Notre Dame at the Orange Bowl, Mira, Jr. set the school record with 21 tackles. A week later, Mira Jr., piled up 20 tackles in a thrilling 20-16 victory over No. 8 South Carolina at the Orange Bowl. Mira, Jr. is the son of current Hall of Fame and legendary Hurricane quarterback George Mira. The Mira's join Eddie and Gary Dunn as father/son members of the University of Miami Sports Hall of Fame.